Tripping.com raises $16 million in Series B financing from investors. The website acts as an aggregator for vacation home rentals with more than 5 million listings in 100,000 worldwide destinations. 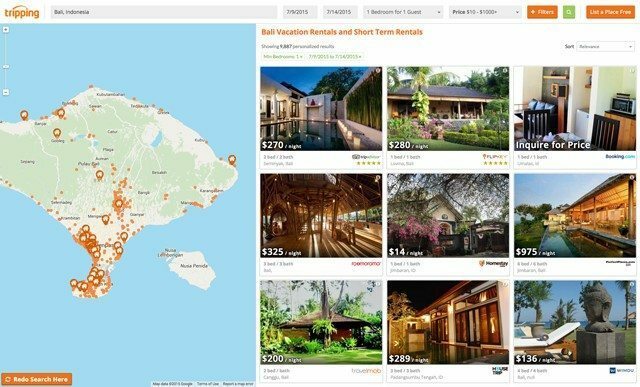 Vacation property owners can promote listings for $19.99 a month on Tripping.com. If your free listing on FlipKey, VRBO, PerfectPlaces and Vacation Home Rentals isn’t getting short-term renters in the doors, then it might be time to boost the listing. One option for the boost: Tripping.com. Tripping.com has been in the vacation home rental marketplace since 2011, but the company has seen a recent massive boom in growth and revenue. The listing aggregation site pulls more than 5 million listings from 100,000 worldwide destinations that are also featured on sites like HomeAway, VRBO and Booking.com. At the end of July, Tripping.com secured $16 million in Series B financing from investors throughout the world. The news was released the same day as the company’s growth metrics, which were recorded at a whopping 2,918 percent increase in traffic and 2,390 percent increase in monthly revenues. The website is specifically for vacation property owners who already have their site listed, serving as a way to increase booking and visibility. According to the site, listings broadcast on Tripping.com receive an average of 75 percent more clicks. Packages on the website start at $19.99 per month, or $9.99 a week, and guarantee first-page ranking in search results; however, the company doesn’t specify how that reach happens. Other benefits the website touts include guaranteed placement in the desired destinations, a ribbon icon to draw attention to the listing and early access to advertising opportunities. Property managers not interested in paying a monthly fee can get free placement on tripping.com through free service websites like FlipKey. Tripping.com also offers vacation property owners insight on emerging trends, news and companies making a splash in the market. Tips for property managers — such as the most in-demand vacation rental amenities, most searched vacation cities and landlord trends — are available on the website. The company recently partnered with Barcelona, Spain-based apartment rental platform Only-apartments to bring even more listings to the tripping.com website. The goal in this partnership was to expand the website’s coverage of the European market, as well as in the 100-plus cities where Only-apartments has a presence. Where are the best up-and-coming cities for vacation rental investment?